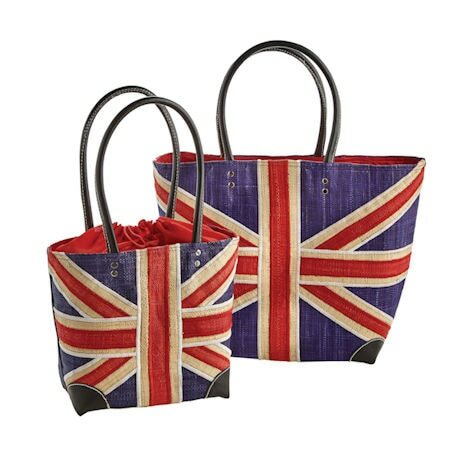 The essential summer straw bag, lightweight, crisp, and emblazoned on front with the Union Jack. Bag has padded black vinyl handles, vinyl reinforced corners, and a red poly lining with drawstring top. Handles fit comfortably over the shoulder. Large is 12 ½"w x 13"h x 7 ½"d. Small is 6"w x 9"h x 5 ½"d. Imported.